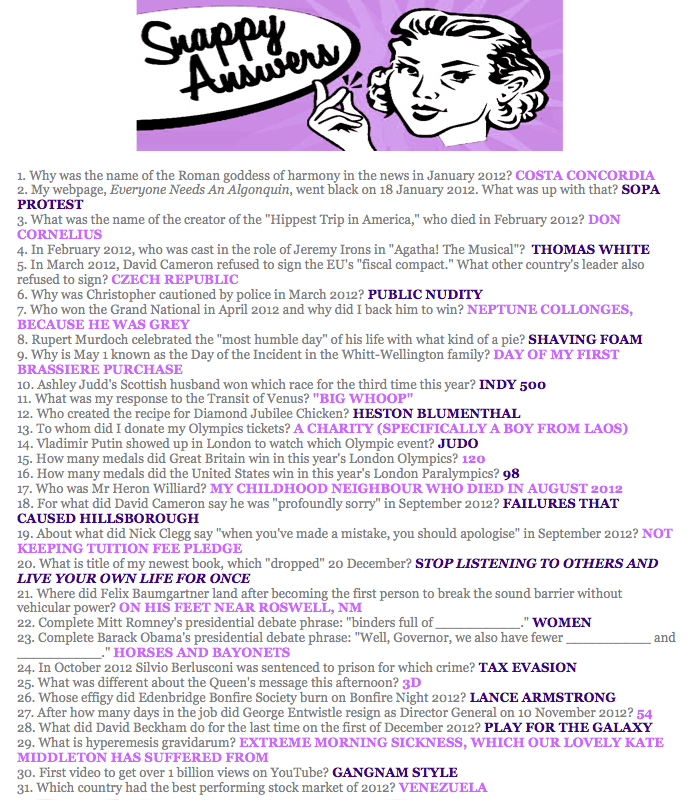 If you missed the second half of my fabulous Large, Chubby Quiz of the Year 2012, the questions are listed below. If you’d like to compete against thousands to win something (I’ve not decided just yet), please send you answers (written coherently, please) to onagathasbehalf@gmail.com by noon GMT, 2 January 2013. 17. Who was Mr Heron Williard? 18. For what did David Cameron say he was “profoundly sorry” in September 2012? 19. About what did Nick Clegg say “when you’ve made a mistake, you should apologise” in September 2012? 20. What is title of my newest book, which “dropped” 20 December? 21. Where did Felix Baumgartner land after becoming the first person to break the sound barrier without vehicular power? 24. In October 2012, Silvio Berlusconi was sentenced to prison for which crime? 25. What was different about the Queen’s message this afternoon? 26. Whose effigy did Edenbridge Bonfire Society burn on Bonfire Night 2012? 27. After how many days in the job did George Entwistle resign as Director General on 10 November 2012? 28. What did David Beckham do for the last time on the first of December 2012? 29. What is hyperemesis gravidarum? 30. What was the first video to get over 1 billion views on YouTube? 31. Which country had the best performing stock market of 2012? TIE-BREAKER:Why am I so lovely? Click here to display the correct answers. Alas, I’ve had to declare no winner in the quiz. Unfortunately, the entrant with the most correct answers is someone I once slept with, and I was afraid I’d be accused of rigging it in his favour, if you know what I mean. So I’ve declared a mistrial, and we’ll have to do it all again in eleven months. But well done to you all! Well, your mother is a beautiful person!